The UK's National Cyber Security Centre (NCSC) has issued easy to follow guidance to small businesses on how to stay safe online. The guide highlights common online dangers and provides practical steps to assist businesses in improving their cyber security. It is split into different categories and includes information on backing-up data, passwords, avoiding phishing attacks and keeping devices safe. Did you know that 45% of micro and small businesses identified a cyber security breach in the last year? This is just one of the interesting statistics that is highlighted in a report produced by the Department for Digital, Culture, Media and Sport earlier this year. Another statistic to note is that 39% of micro or small businesses with no risk management measures think they are too small for cyber security. To find out where your business might be vulnerable or at risk, I'd suggest that you complete the Government's Cyber Essentials Self-Assessment Questionnaire. This will flag up the areas that you could improve on. I also came across the Cyber Aware website, which offers useful and practical advice to both consumers and businesses. In conclusion, to save your business time, money and potential reputational damage, it's best to take steps now to reduce your risk of becoming another statistic. 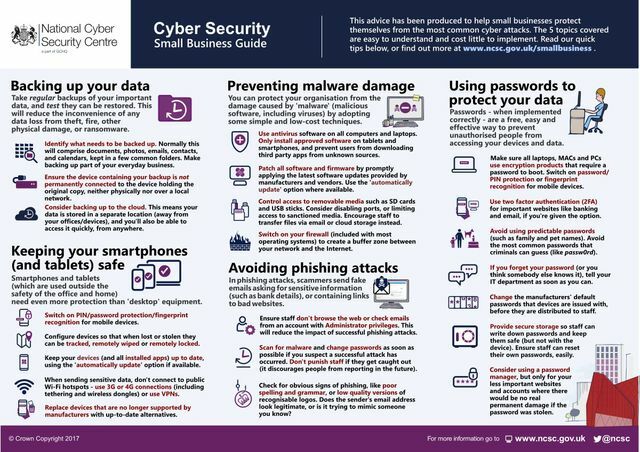 The National Cyber Security Centre guide is definitely worth reading: Cyber Security: Small Business Guide. UK small businesses can shield themselves from potential online attacks thanks to a new guide created by the National Cyber Security Centre (NCSC). Research by the Department for Digital, Culture, Media and Sport (DCMS) earlier this year found that nearly half (45%) of all micro/small businesses identified a cyber security breach or attack in the last year. Despite this among the quarter of micro/small businesses that consider it a low priority, over a third (35%) have nonetheless identified a breach.